Everyone likes a good book, right? And over the holidays there’s actually time to read them! For your friends, family, picky people and practical strangers that are expecting gifts, here’s what you do. P.s. Don’t follow this list blindly… If you know that your person really doesn’t like crime books – don’t just get her one because I said so… Use your brain. Go for a really beautiful copy of their favourite novel. 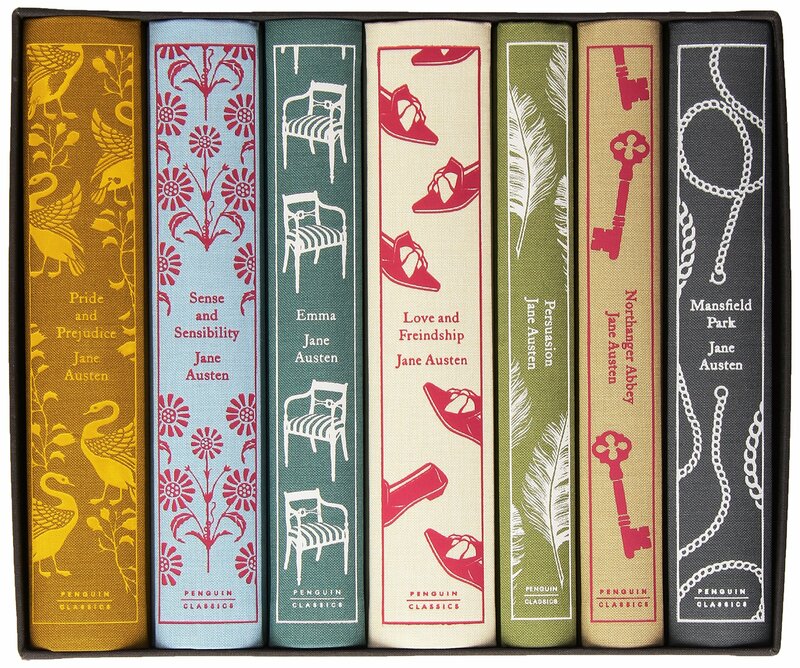 Penguin Hardbacks are forever releasing lovely versions of classic novels. They look so pretty on the shelf! If you don’t know what their favourite is… Go to the bookshelf, find the book that’s the tattiest, most dog-eared and then hope that penguin has turned into a pretty version. For more specific advice… If your him or her is a bit chaotic in their reading choices. Get them something that if they don’t read you might… Something that taps into our childhood reading that you’ll find impossible to put down… The beautiful hardback thing still applies by the way! La Belle Sauvage: The Book of Dust Part One by Philip Pullman – an obvious choice for this year. It’s for anyone really (except kids I don’t think I’d give it to kids. Maybe teens…) It’s really lovely. And if they read Northern Lights as kids they’ll love this. The Colour of Magic by Terry Pratchett – At this stage, I think I’m just picking books for myself. It’s hard not to love Terry Pratchett though. Greek and Roman Myths by Philip Matyszak – In our house Greek and Roman myths were a common passion… Who doesn’t love these old beautiful stories? We all know a Potterhead… Get them one of these, it’ll keep them happy. Harry Potter and the Prisoner of Azkaban by J.K. Rowling, Illustrated by Jim Kay – Every year they bring out a new illustrated edition and they really are beautiful. Fantastic Beasts and Where To Find Them by J.K. Rowling, Illustrated by Olivia Lomenech Gill – Again, a beautiful illustrated edition of a lovely story. I’m a big believer in giving people who don’t like reading Graphic Novels. They’re quicker and easier to digest (sometimes.) And they’re still amazing stories! This might not be everyone’s cup of tea… but here are my picks anyway. Patience by Daniel Clowes – This is a graphic novel heavyweight. A Sci-fi love story. Vibrant illustrations. Graphic Science by Darryl Cunningham – Seven stories about great (but forgotten) minds from around the world. This is non-fiction and super interesting. Thing Explainer by Randall Munroe – Clever. It uses the most used words to explain complex thingymajigs. It’s good. Good Night Stories for Rebel Girls by Elena Favilli and Francesca Cavallo – Stories of great women throughout history. This is good for everyone! Where’s the Wookiee – Okay so this one’s kind of dumb but funny. Fun for the family! We all have that person who has too much money or at least pretends that they do. Get them a posh book for… whatever those people do with posh books. Wildlife Photographer of the Year 2017 (Portfolio 27) – They’ve made 27 of these so they must be doing something right. Just beautiful photographs of animals. Life-Changing Magic of Tidying by Marie Kondo – Wanna tell someone their messy? This is the book for them. It’s actually really great. I’ve talked about it before and have used it multiple times in my search for a clutter free lifestyle. It makes a really lovely gift. Lagom by Linnea Dunne – Lagom is the Scandi lifestyle trend. The concept (roughly) follows the idea that anything more than ‘just enough’ is too much and a waste of time. It’s perfect gift for someone who needs more balance in their life. One Line a Day – This one isn’t a book. It’s an empty journal that asks for just one line a day. Great for someone who wants to write a diary but might find it a bit daunting. This book has beautiful gold edges and can fit into a pocket. It’ll make a really nice present for someone who wants to get to know themselves better. I hope that something on this list will help you in your quest for gifts! Let me know if this was an alright idea for a post and I’ll do another one in the future.